By filling out this or any DATAVERSITY® form, as applicable by local privacy laws, you agree to receive marketing e-mail notifications from DATAVERSITY, listed sponsors, and listed partners. Just click the “unsubscribe” or "Manage Your Email Subscriptions" link in any e-mail to unsubscribe. Metadata Management is more important than ever. More than 80% of the survey respondents upon which this report is based agreed that its value to the contemporary, data-driven enterprise is greater than at any time in the past. Two of the primary key trends driving such an impact are the growing technical complexities of the entire Data Management industry due to a range of new developments such as non-relational databases, Big Data processing, Semantic technologies, the Internet of Things, and an ever greater need to combine legacy data with new data types. Along with such developments, there is also a greater push by business users to work directly with data due to regulation and compliance issues, Self-Service BI, and an assortment of different Data Governance, Data Quality, and other initiatives within enterprises today. 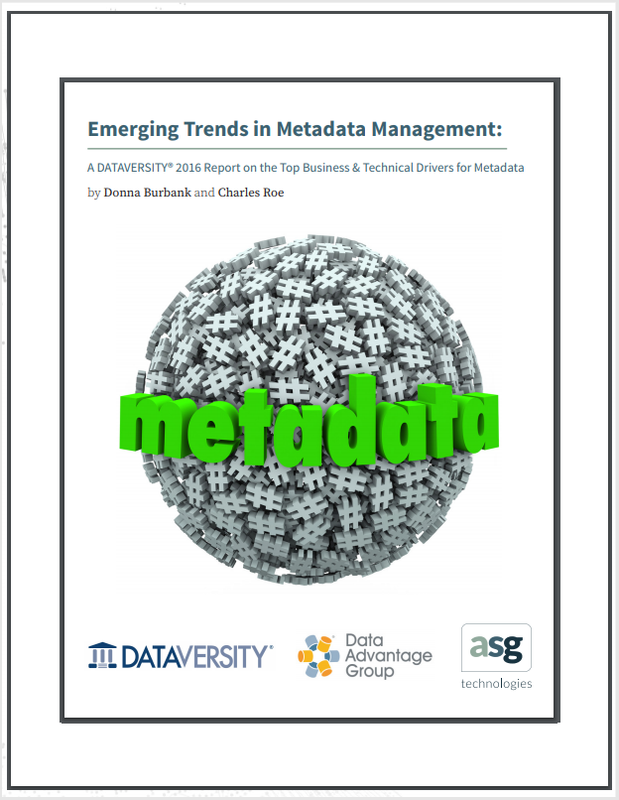 Such trends have created an ever-increasing imperative to manage Metadata with more accuracy, clarity, and reliability. Why is Metadata important to your organization? How do you receive training in Metadata Management? For what types of information do you currently manage Metadata? What types of information would you like to manage Metadata for in the future? What are your primary Metadata use cases? Future use cases? What Metadata tools and functionalities are most important to your organization? Do you have a defined Metadata Strategy? This report evaluates each question and provides subsequent analysis in a detailed format that includes the most noteworthy statistics, direct comments from survey respondents, and the influence on the industry as a whole. It seeks to present readers with a thorough review of the state of Metadata Management as it exists today. Copyright © 2011-2019 DATAVERSITY Education, LLC . All Rights Reserved.